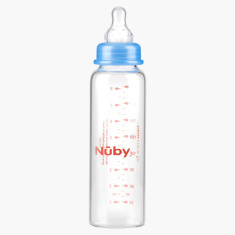 Nuby Feeding Bottle - 240 ml | Blue | Anti-colic bottles to prevent baby from gas and colic. Upgrade your kid's essentials with the help of this feeding bottle which is chemical free and non-toxic. This bottle is an anti-colic bottle which prevents baby from forming gas and colic.